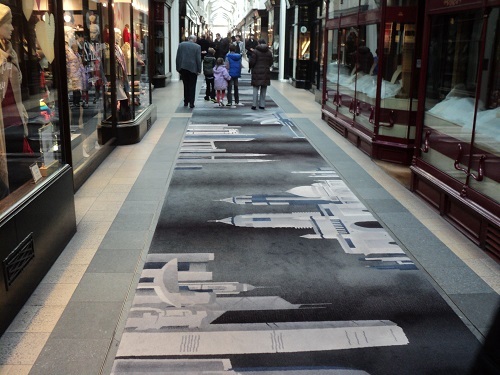 Away from the crowds of Regent and Oxford Street, Piccadilly offers a upmarket more personal shopping experience. 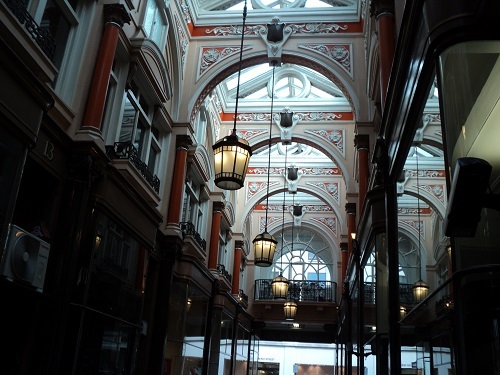 Amongst the high quality shops like Hatchard’s and Fortnum and Mason is a number of 19th century shopping arcades which were the origins of the Grand shopping gallery and the modern shopping arcades. 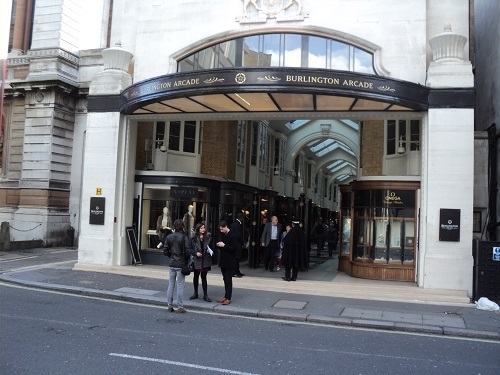 One of the oldest arcades is also the longest, the Burlington Arcade was opened in 1819 and was built by the Lord George Cavendish, younger brother of the 5th Duke of Devonshire, who had inherited the nearby Burlington House. 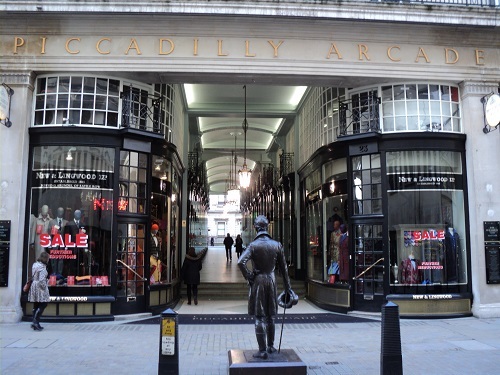 The arcade enabled shoppers to walk along protected from the weather to peruse the 72 small shops, the arcade also had its own security with its Guard or Beadle patrolling the walkway and keeping out undesirables. This tradition is still maintained today when the shops are fewer but probably more exclusive. Present tenants include a wide range of clothing, footwear and accessory shops, there is also a number of Art dealers, jewellers and dealers in antique silver. 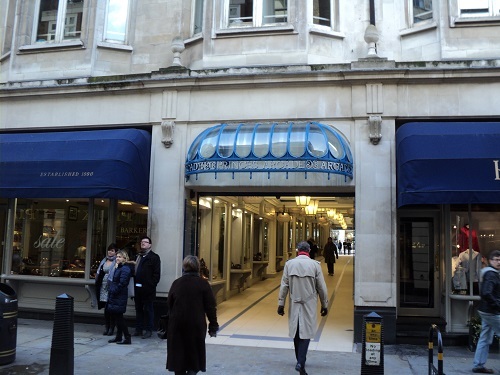 The Royal Arcade built in 1879 is smaller than the Burlington Arcade and but provides a connecting walkway between Old Bond Street with Albemarle Street. This arcade was originally known as just the ‘Arcade’ but one of the shops was patronised by Queen Victoria it became the Royal arcade. The speciality shops in this arcade sell fine silverware, art, bespoke shoes and high-end chocolate. The other two arcades in the area were opened in the 20th century ,Princes Arcade forms part of Princes House which was originally built to house the Royal Institute of Painters in Water Colours and was opened by the Prince and Princess of Wales in 1883. The Arcade itself was opened in 1933. The Piccadilly Arcade in opened in 1910 and quickly gained a reputation for high quality retail outlets. 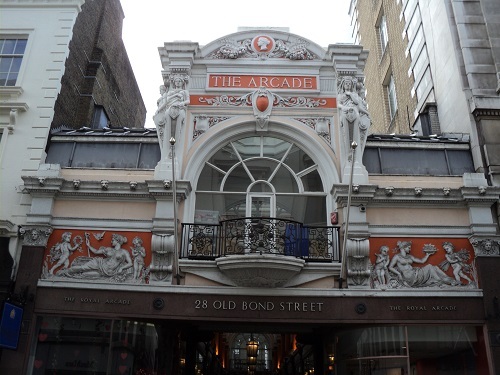 All these arcades catered for the high number of rich and well to do patrons that lived in the nearby Mayfair and St James and to some extent they still do, however regardless of your spending power it is worth visiting the arcades for a slightly different shopping experience. By londonvisitors2014 in Shops of London, Speciality Shops on March 20, 2014 .